Israeli security forces confiscate illegal weapons, arrest 17 suspected terrorists. 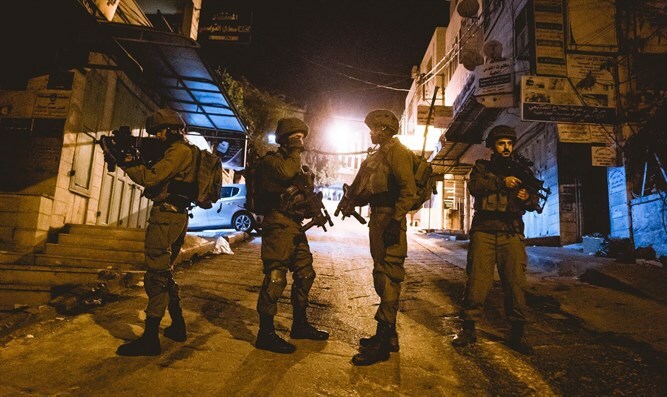 The Israel Defense Forces on Wednesday night arrested ten suspected terrorists in Judea and Samaria. All of the suspects were wanted on suspicion of involvement in terror and violent disorders directed against Israeli targets. They were turned over to security agencies for further investigation. In the Hevron-area town of Fawwar, IDF forces arrested a Palestinian Authority (PA) Arab man for throwing 24 firebombs at IDF forces last month. The IDF and Border Police also found illegal weapons in the PA town of Nabata, and the Jenin-area town of Burqin. Meanwhile, the IDF, Border Police, and Israel Police, on Wednesday night found and confiscated illegal weapons near the site where Rabbi Michael Mark was murdered in a July 2016 terror attack. Among the illegal weapons confiscated were four pistols, three air rifles, four knives, military equipment and two thousand bullets of various types. All of the weapons were found in the Dir Azah in the southern Hevron hills. A weapons dealer in charge of the site where the weapons were found was arrested, as were five other suspects. All six have been transferred to the relevant security agencies for questioning.